What Are Truffles and How Are They Made? Truffles are bite-sized chocolate confections. They can have many ingredients, but at their most basic, they require just two components: chocolate and cream. Truffles can be formed and finished in many different ways; they can be molded into fancy shapes, airbrushed, covered with luster dust, or sprinkled with a vast assortment of sprinkles, nuts, chocolate shavings, coconut, and more. Traditionally, truffles are formed into small balls by hand and rolled in cocoa powder, giving them a rustic, misshapen look reminiscent of the fungus known as truffles—which is how they got their name! How Do I Make Truffles? Although truffles have a gourmet reputation, they're actually one of the easiest candies to make at home! The two ingredients you must have are chocolate and heavy (or whipping) cream. The cream is heated and poured over chopped chocolate, then they're whisked together until they make a shiny, silky mixture called ganache. 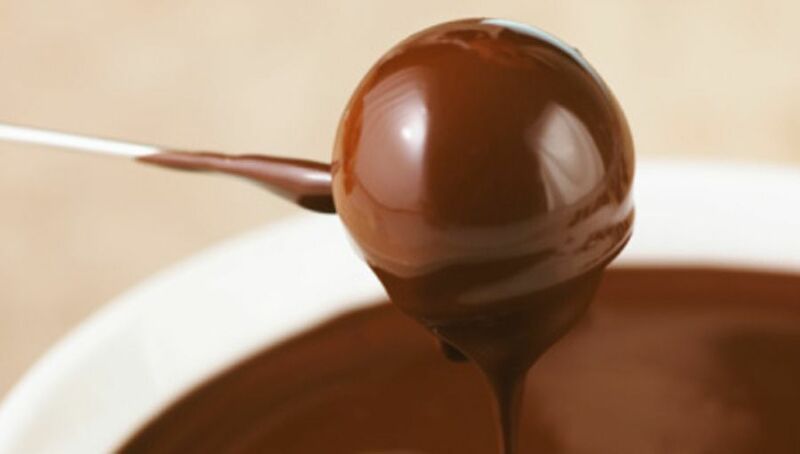 Ganache is the building block upon which all truffles are built. Any good-quality chocolate will work for making truffles, but the most versatile chocolate you can use is a nice semi-sweet chocolate that's about 60% cacao solids. Beyond chocolate and cream, different recipes might call for a bit of butter and/or corn syrup (to improve the texture and mouthfeel) and assorted additions like extracts or flavoring oils, chopped nuts, citrus zest, or fruit puree. After the ganache is made and has time to set up, the truffles are rolled into small balls and then either dipped in chocolate or rolled in cocoa powder, powdered sugar, or any number of crushed nuts or candies. If you're looking for truffle recipes, you've come to the right place! We have hundreds of truffle recipes, from classic chocolate truffles to white chocolate varieties to more experimental and modern flavors. Ganache is an emulsion, and sometimes, that emulsion breaks and you might notice a thin layer of oil on top of your chocolate. Fortunately, broken ganache can usually be fixed. If it is cool, gently warm it in the microwave in 10-second bursts. Whisk in between each session, until it reaches about 100 F. Often, heating the ganache back up is enough to bring it back together. If this doesn't work, add a teaspoon of room temperature milk to the ganache and continue whisking until it comes together. If your ganache is already warm, try whisking it consistently. Often this will make the ganache look worse at first, but after a minute or two of mixing, it will frequently come back together. If it has not come together after several minutes, try adding a spoonful of room temperature milk and continue whisking. The biggest culprit behind cracked chocolate coating is dipping cold truffles in warm chocolate. As the truffles come to room temperature, they expand and as a result, the shells often crack. The best way to avoid this problem is to let the truffle sit at cool room temperature for 12 to 24 hours before dipping them. This causes the truffles to form a "skin" and makes them stable enough to dip without needing to be chilled, and thus, avoids the problem of dipping cold truffles. If you end up with cracked truffles despite your best efforts, the cracks can sometimes be disguised with a coating of nuts or sprinkles or a drizzle of chocolate on top.